After inspecting your damage and identifying the causes, we will prepare a written proposal that outlines all work to be done. All work will be done by our insured and certified technicians, quickly and with minimal disruption. At the completion of the work, we will send you a written, transferable warranty. Whether your foundation is plagued by settlement, tilting, bowing, bulging, severe cracks or disintegration, Foundation Systems of Michigan has affordable solutions to help you solve your foundation problems permanently while significantly increasing the value of your home. When it comes to making sure your home has a solid foundation, Foundation Systems of Michigan uses only quality, proven products to get the job done. The Supportworks, Inc. products that we use are manufactured in accordance with strict industry standards and have been field tested by more than 100 of the top structural repair contractors in our North American network. Supportworks is the only manufacturer that maintains an in-house staff of both structural and geotechnical engineers. 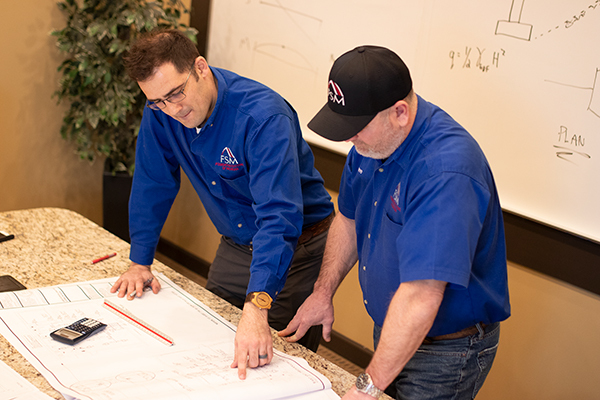 When you schedule a free on-site inspection and consultation, our foundation specialists will come out and explain what caused your problem and which options are best for repairing it. 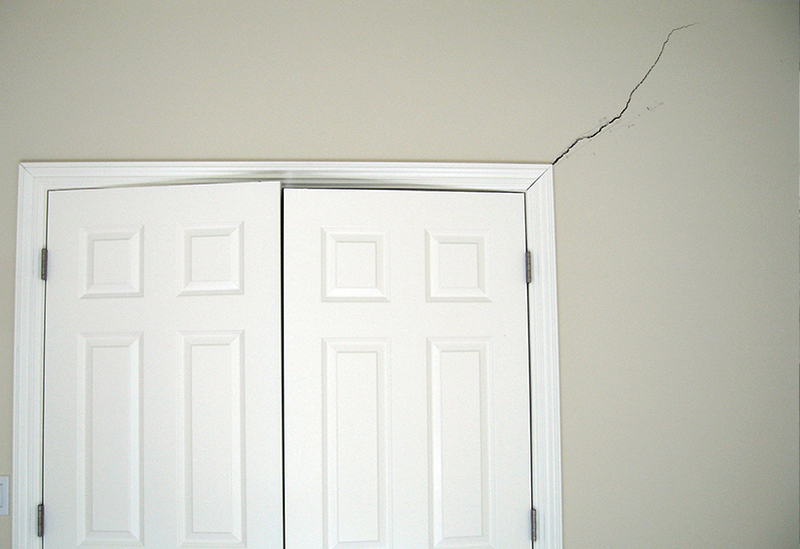 To schedule your free structural repair quote, call or e-mail us today! We're proud to serve Ann Arbor, Saginaw, Traverse City, Midland, Clinton Township, Waterford, Bloomfield Hills, Taylor, Petoskey, Troy, Sterling Heights, and the surrounding areas. 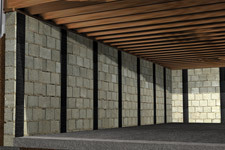 Everyone knows that foundation walls carry tremendous loads (forces) to footings and the ground below. 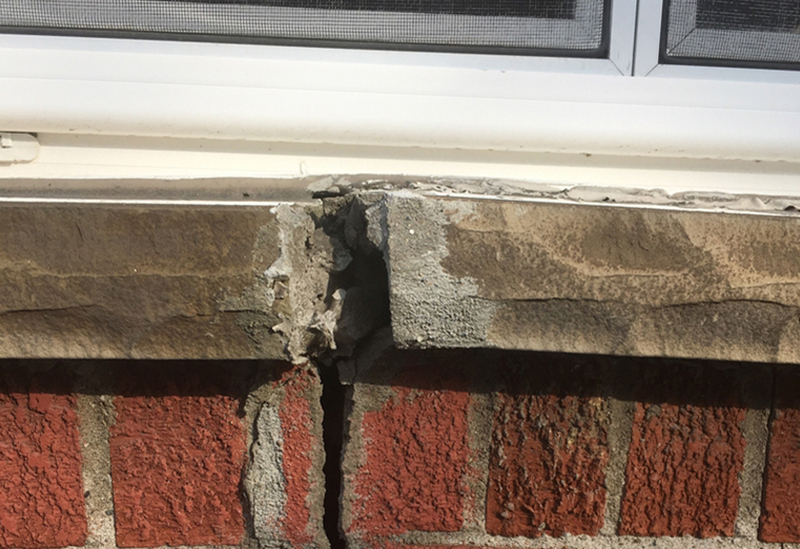 Homeowners often forget, however, that there are sometimes lateral forces or sideways pressure as well – until their foundation begins the crack, bow, or slide at the bottom, or tilt at the top. 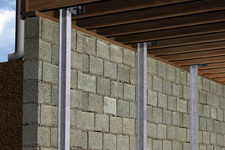 Supportworks, Inc.’s Geo-Lock™ wall anchor system counteracts soil pressure with steel rods and plates that extend from the inside face of your foundation wall to stable, undisturbed soil outside your home. 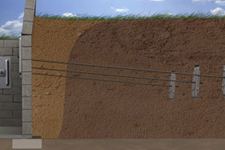 Because the rods are threaded, the anchors may be used to straighten walls in many cases. If wall anchors cannot be used to strengthen your foundation wall because of space restrictions, such as nearby property lines or outbuildings that are in the way, Supportworks often recommends its PowerBrace™ wall repair system. These adjustable steel I-beams can stabilize bowed or tilting walls. Over time, the may be used to force walls back to their original position. Manufactured to stringent industry standards, PowerBrace™ components are zinc-coated to keep them corrosion free. Structures and slabs settle or sink when the soil beneath them is unable to bear the load or forces bearing down upon it. The solution is usually to drive piers to greater depths, where soils are firmer. Piers come in several types, including slab piers and helical piers. Our experts can assist you in determining the best pier for your situation. Piers may be used in conjunction with compact hydraulic jacks to raise slabs and foundations to their original, level positions. 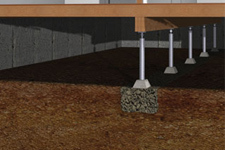 Crawl space foundations often include a series of piers that support beams, which in turn support framing for floors. If the piers shift or settle, or begin to deteriorate due to wood-damaging insects or rot, the floor above will sag. In addition, drywall may crack, and doors and windows may jam. The remedy is often to replace the piers – a tall order in such a confined space. FSI’s SmartJack® system, however, installs with minimal disruptions. They restore stability quickly and can be adjusted to bring sagging floors to back to level. 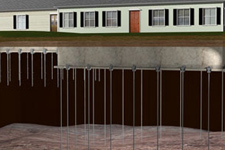 Your Supportworks dealer can then address the causes of your crawl space problems, such as excess humidity, through techniques that include waterproofing and encapsulation. Super strong carbon fiber straps offer a quick, affordable alternative to I-beams for stabilizing foundation walls that have cracked or bowed. Once our technicians determine the number of straps required to counteract external pressure, they bond them to the foundation wall with epoxy. Although FSI’s CarbonArmor® system cannot restore a wall to its original vertical position, it will prevent further movement and cracking. CarbonArmor® straps do not protrude from the wall as do wall anchors and I-beams, so they can easily be covered by paint or wall panels.